courtney west: Currently Reading + Suggestions Needed! If anyone out there follows me on Instagram you probably already know what I've been reading lately. First up are these two books that I purchased from Amazon a few weeks ago. Blog, Inc. is a useful little book on (you guessed it) blogging. I started blogging again last year to share my life with my family and friends who were far away as well as trying to document my life as I left a job and got married. However, I've really begun to love the blogging community and I bought this book as a way to help me learn to put myself out there and jump into the world of bloggers as best I could. Despite the fact that I found this book to have a little bit of "leave it" advice for someone like myself, I've really enjoyed reading it. 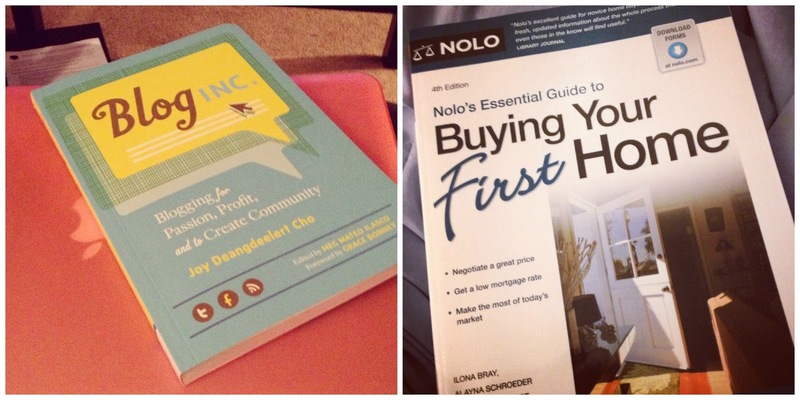 Nolo's Essential Guide to Buying Your First Home has been shared between Jason & I. It definitely isn't the most exciting material, but it's teaching me a lot that I needed to know about the homebuying process. I also have a giant stack of magazines next to my bed. I'm slowly but surely catching up with them; I can't believe how quickly I used to plow through them when I was a flight attendant. I used to live for the days that new magazines hit the stands, but now I'm constantly behind! Now, here's where I need help. Aside from my magazines, Blog Inc and the homebuying book I haven't been reading much at all lately because I'm not sure what I want to read next. I think I blame Andy Cohen's Most Talkative for that. I absolutely adored the entire book. I didn't want it to be over...and now that I've finished it I don't know how the next funny memoir book I read could possibly live up to it. I also recently read Girls in White Dresses by Jennifer Close. I honestly am unsure how I felt about this novel, and based on the reviews on Amazon, it seems as if many people feel the same way. The book didn't seem to have a true plot, but I found myself compelled to keep reading. This genre of novels about women in my age group always appeal to me, though. I can't seem to get enough! Any suggestions for a good book to read now? I'm open to nearly anything, please help me out and let me know what you're reading and loving!